Please be patient while our entire catalog loads. sp0305150001 -- Special Purchase per 2/19 email. BEST DEAL! Comprehensive MIDI system - MIDI2CV8 MIDI to CV converter, 9710 VCA, 9720 VCO , 9730 VCF, FracRak Case and patch cord set. Less US-type 120VAC to 12VAC/1A wall-mounted transformer. 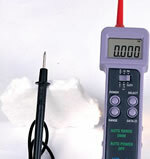 Special Purchase Item, sp1221150001, per 12/21 email. Special Purchase Item, sp1221150002, per email. Special Purchase Item, 9206, less case. Special Purchase per email -- 9770R-12 less US-type transformer. Special Purchase per email -- 9770R-15 less US-type transformer. Similar meter to its big brother. It does not have current ranges, but the form factor is really interesting - and the price is much lower. 6720K Quadrafuzz Kit includes circuit board electronic parts, 12VAC wall-mount transformer, switches, jacks, controls, knobs and manual. Front panel for the Parametric Equalizer. The TubeHead is a low-cost, two-channel vacuum tube pre-amplifier. 9308FP FatMan 2U Rack Panel standard .125 inch thick 19 X 3.5 inch black anodized, punched and screen printed panel. The 9741 dual voltage-controlled amplifier module consists of two independent VCAs which can be used to modify audio or control signals. 6720FP Front Panel 1U standard .125 inch thick 19 X 1.75 inch black anodized, punched and screen printed panel. Optional front panel for the 6790K dual limiter kit. Optional front panel for the 9110K direct interface kit. 1U Rack Panel standard .125 inch thick 19 X 1.75 inch anodized, punched and screen printed panel. 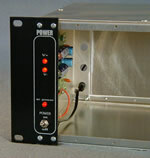 Optional front panel for the 9210K stack-in-a-box kit. Optional case for the phantom power pre-amp. Option front panel for the 9303K Four Band EQ. Optional enclosed case for 2 9407K Tube MicPreAmp kit assemblies. 9506C Project-r* MS Stereo Mic black anodized and legended case including all hardware. 9700FRM FracRak Accessory Kit adds Transformer, Switch, 8 Stereo Jacks, punched, black coated panels with a light texture finish and white legend, 2W FracRak panel and all hardware. 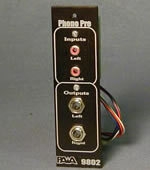 RIAA Phono Preamp FracRak panel. The TubeHead is a low-cost, two-channel vacuum tube pre-amplifier (NOTE: International version - ships without 110V power supply). Kit includes circuit board, all electronic parts, power supply, wire, hardware, knobs manual. NOTE: International version - ships without 110V power supply. Kit includes electronic parts, electret mic elements, circuit board, controls, knobs and wall mount power transformer. International version - ships without 110V power supply. Adds transformer, switch, 16 jacks and fully enclosed 1U rack case with punched, black anodized, grey legended panel and all hardware. The HiFi version of the TubeHead. Circuitry is identical to the rack mount version (NOTE: International version - ships without 110V power supply). 9308C FatMan desktop case includes anodized and screen printed aluminum and wood case parts and all hardware. Combines 3 VCAs, a White Noise Source and full function ADSR/LFO Envelope Generator. FracRak accessory kits include punched, painted and screen printed Panel, 1/8" Jacks, hardware and other mechanical parts required to build a FracRak format module. Two independent VCOs with Ramp, Triangle, Sine and Pulse waveforms. Kits includes punched, painted and screen printed Panel, 1/8" Jacks, hardware and other mechanical parts. A two-section module, the 9746 features two sets of patch points for combining or splitting signals within a system. Two identical, independent filters with Lo Pass, Band Pass and Hi Pass outputs. Kits includes punched, anodized and screen printed Panel, 1/8" Jacks, hardware and other mechanical parts. FracRak Case includes hardware, 7" deep end pieces, mounting rails and black coated rack ears with a light textured finish. Includes top, bottom and rear panels for the FracRak. Kits include tin-lead plated and solder masked circuit board (4" X 2-3/4"), wall mount transformer and all electronic components. FracRak Power Wing Accessory package mounts a 9770 power supply in the end panel of a FracRak case. Audio signals applied to the inputs of the 9748 Balanced Modulator appear at the output, with added new frequencies which are the sums and differences of the applied signals. This module generates 'white' and 'red' and 'blue' noise. Starting with a transistor 'avalanche' junction noise generator the versatile 9751 may be reconfigured to use an optional Zener-diode for noise generation. 9700VHZ Volts/Hertz Option for exponential pitch cv scaling. Includes all components and circuit board with mounting hardware.